The Polynesian Resort’s only counter service location is Capt. 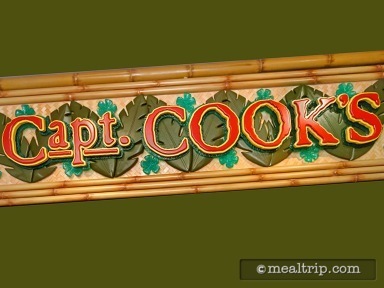 Cook’s, which is located on the ground floor of the resort. The quick service location offers both interior and exterior seating and is basically always open (although the late-night menu is limited to grab-and-go type selections... muffins, cookies, that sort of thing). 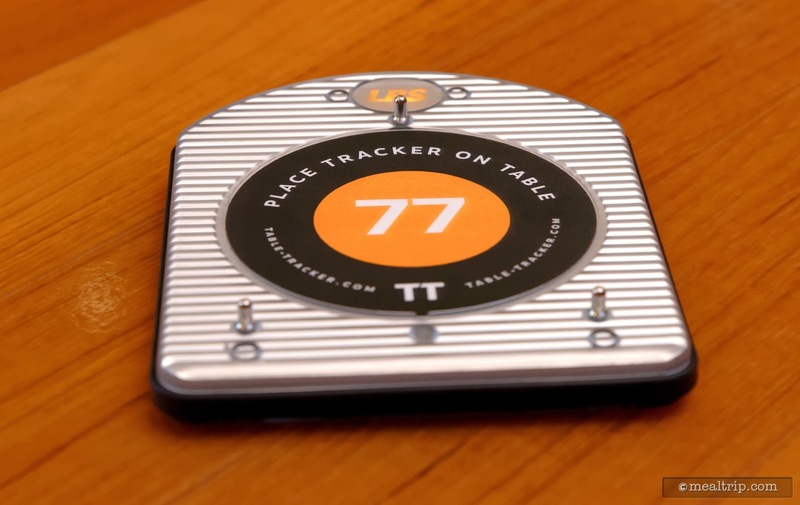 The lunch and dinner menus are the same, which isn’t a bad thing. While we have seen Capt. Cook’s serve some rather "normal" quick service food in the past, they now seem to be including more of the resort’s Polynesian/Asian influences in their culinary offerings... and that’s what we like to see! I haven't been to Capt. Cooks in a while, (not since they renovated the decor a few years ago actually), so I decided to stop in the other day and try out a couple of the items. 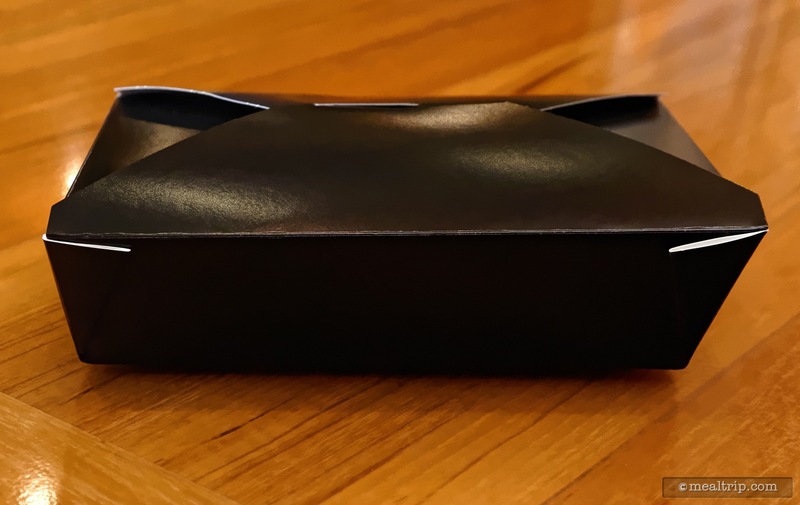 The counter service location offers some of the standard hot-dog and hamburger options that you would expect to find, along with a few unusual items. Those items that are unique to the location, are the ones I usually select. 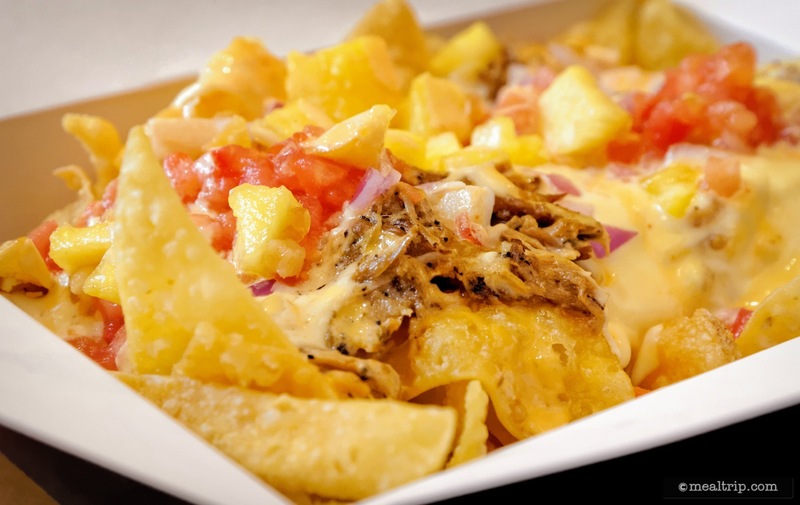 The Pulled Pork Nachos are said to feature Onions, Cheese, Spicy Mayo, Tomatoes, and Pineapple Salsa. I should mention that while I do like pineapple (on it's own or in desserts), I'm not a huge fan of pineapple on pizza. I don't know why… I'm a complex person. Back to our nachos, there wasn't a ton of pork on the pork nachos. 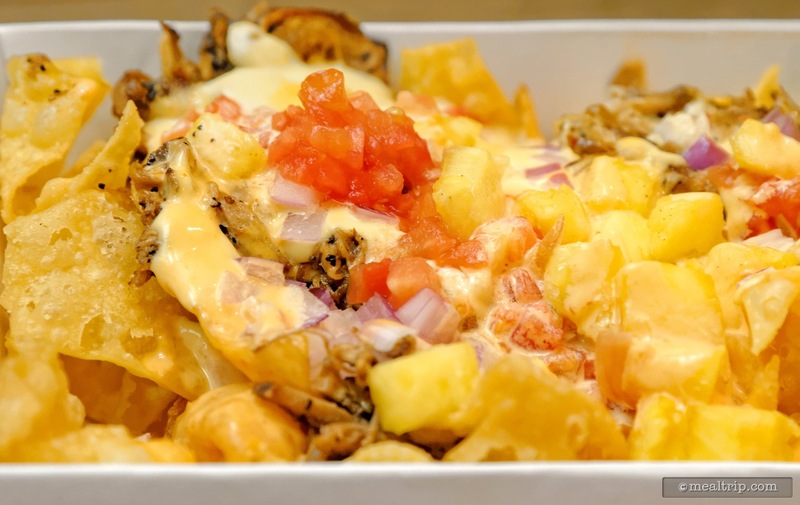 This item (if made the same way each time) should probably be called Mayo Cheese and Pineapple Nachos. There wasn't anything savory here. 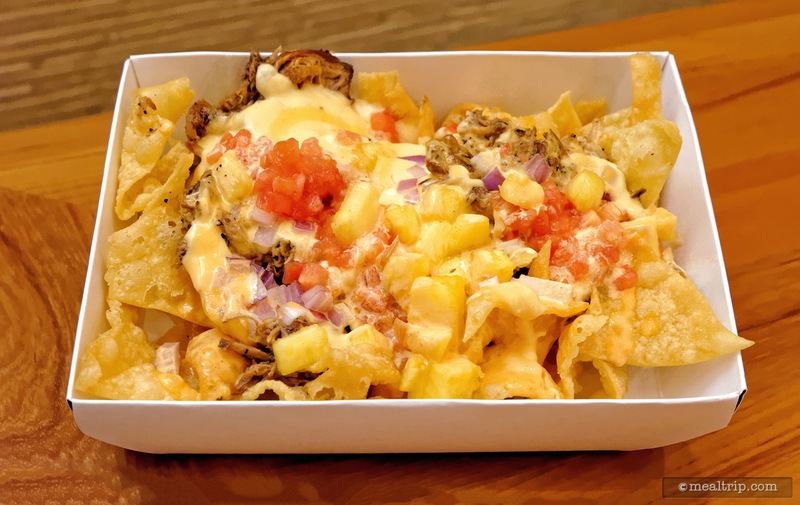 The pork had a mildly sweet sauce, but the odd mix of acidic tomatoes, dairy in the mayo (and faux dairy in the faux cheese) together with the (frankly) soggy nacho chips… didn't leave a very positive lasting impression with me. If you really like semi-savory pineapple dishes… or maybe even pineapple pizza… you might enjoy Capt. Cooks' Pulled Pork Nachos. It just wasn't my thing. 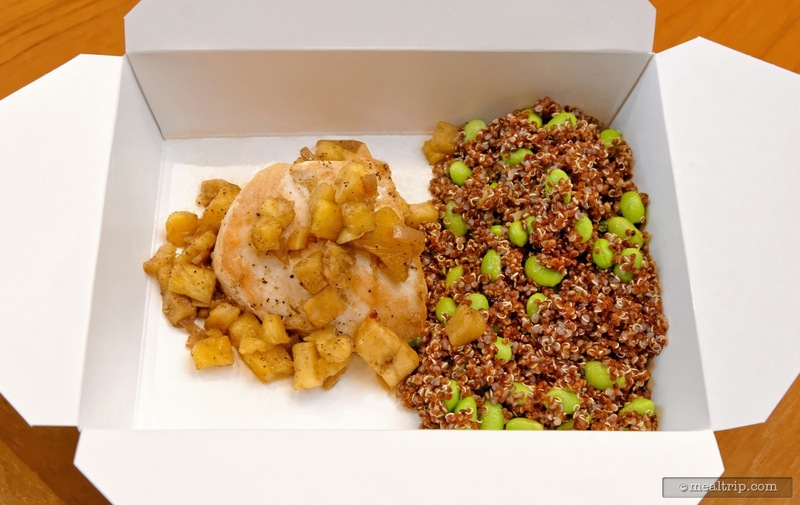 Next up, the Seared Chicken Breast served with Pineapple Sambal, Red Quinoa, and Edamame Salad. Now we're getting somewhere. While this one still didn't have the crave-ability that I was hoping for, it was a surprisingly healthful entree. The seared chicken breast was just that. A good chicken breast that had been only lightly seasoned (with salt and pepper I'm guessing) and then seared. It was topped with a Pineapple Sambal, which is basically grilled, diced pineapple, with a bit of black pepper tossed in. I would add… that a Sambal should have some red peppers or a bit of heat added to it, by way of a chili relish or powder. This Pineapple Sambal, was very mild. 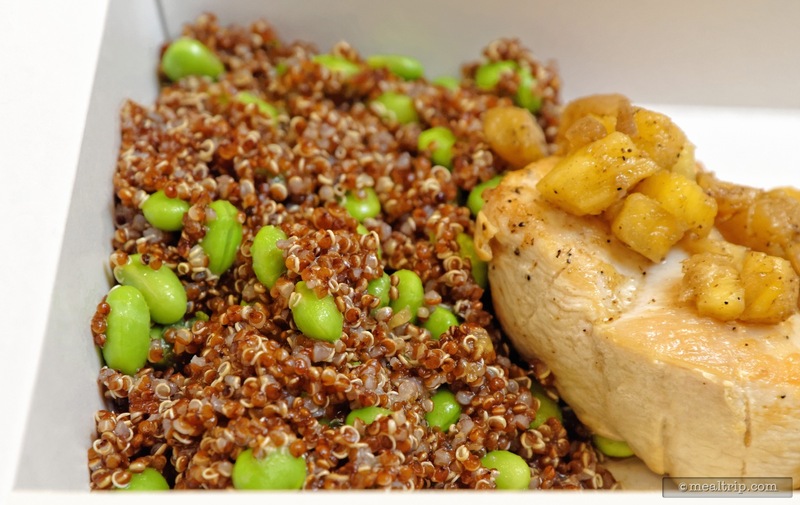 The best part about this entree was the Red Quinoa and Edamame Salad. For starters, it's just great looking. The Red Quinoa and green Edamame beans pair well and there was even a slight citrus hit in the mix (probably lemon-based, to keep those Edamame beans so green). This side dish was served cold, but had a really nice flavor and texture profile… and it's quite good for you as well. 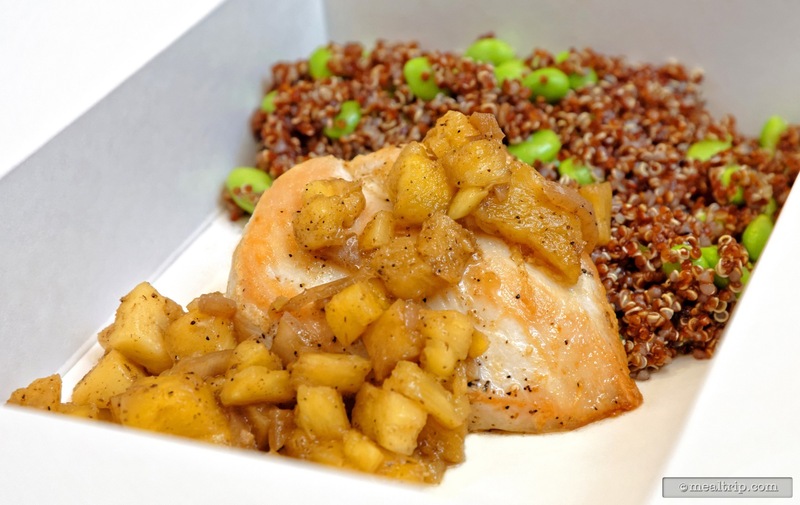 As much as I like the Seared Chicken Breast and Quinoa, I'm not certain I've found "the" item at Capt. Cooks just yet. I've been able to find at least one "you have to try this" entree at most counter service locations, but so far at Capt. Cooks, that item has eluded me.